The following photographs were taken with a 35mm focal plane camera at an exposure of 1/30s, which results in an annoying bright diagonal band across the screen. The prints are on 13x9cm rather brown and vinegary-smelling “silk-finished” paper, so instead I’ve scanned the original negatives, which are now rather dusty and scratched, though the results are somewhat clearer. The trapezoid distortion is a result of my having to shoot from above the axis of the tube in order to avoid reflections from a bright window behind the camera. Some 35mm colour reversal slides were kindly scanned for me by John A Butler, and are much clearer, being taken (on-axis) from the screen of the new Forgestone set. The pages transmitted at Christmas 1978 and afterwards were photographed on panchromatic negative stock and I’ve taken the liberty of colourising them using, as far as I can remember, the original colour scheme. Note the old-fashioned way of labelling sub-pages. The third of four pages would these days be marked “3/4”. Then, it would have been “A B C D”, with the “C” flashing slowly. 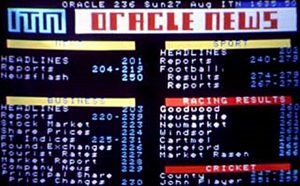 Ceefax had a maximum of four sub-pages, but Oracle sometimes had most of the alphabet strung across a page. 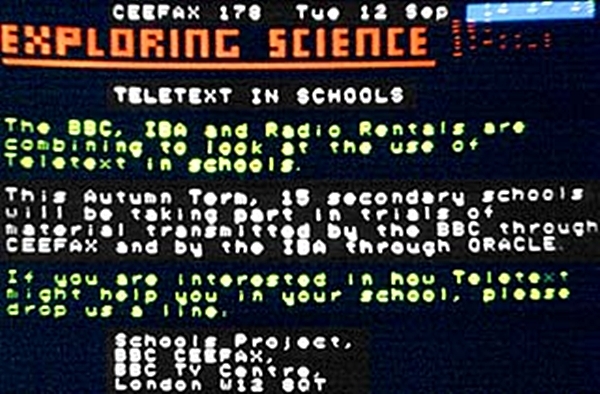 It was Ceefax who instigated the change when they introduced new equipment that could transmit more than four sub-pages. The pages on the Wireless World decoder were selected by thumbwheels on the front panel, so it was not necessary to show the selected page in the top left corner. I opted not to freeze the header display once the page had been captured, so many of these shots don’t show the correct number in the page header. 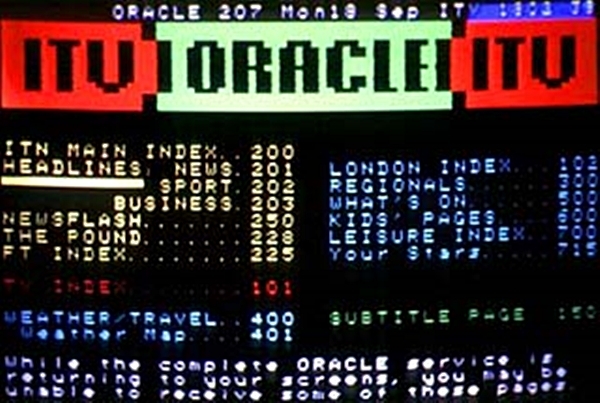 CEEFAX AND ORACLE entered official service in 1976, and all my photographs were taken during that period. Before getting to them however, here are some that appeared in the press during the experimental years 1973-75. 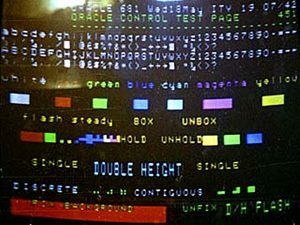 UNTIL 1974 CEEFAX and ORACLE worked on different systems. 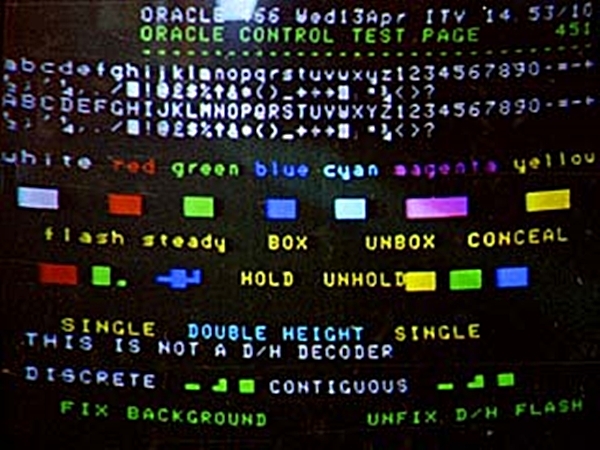 This Oracle test page from April 1973 was transmitted on the original system that had no colour or graphics capabilities. 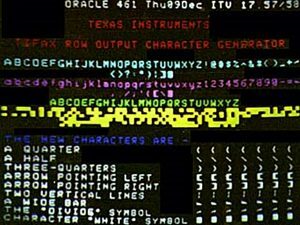 Unlike the final system, in which a full row of text was sent on each data line, here text was transmitted piecemeal, ten characters at a time, with each chunk labelled with its position on the screen. The system allowed for 50 pages, each with up to 22 rows of 40 characters, and the text was clearly intended to be displayed black-on-white, as we tend to see on our computers today. 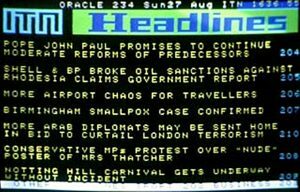 THIS CEEFAX news headlines page from Sat 6 Oct 1974 was displayed on a GEC colour receiver fitted with their experimental teletext decoder. 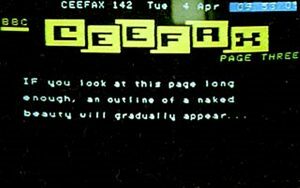 Again, the page shows no colour or graphics, though both would have been available to the Ceefax editor of the day. 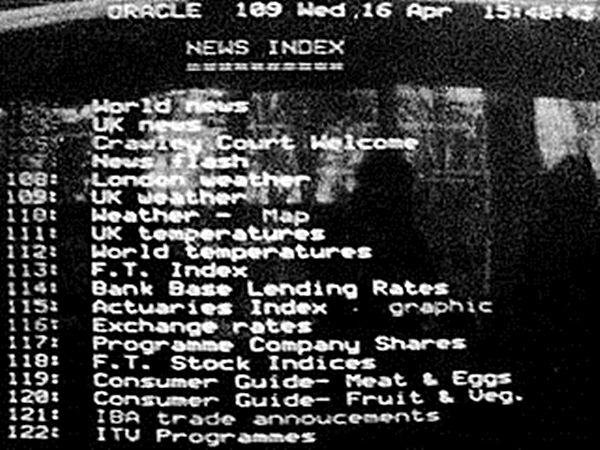 THIS ORACLE news index page from Wed 16 Apr 1975 has coloured text, but no graphics. 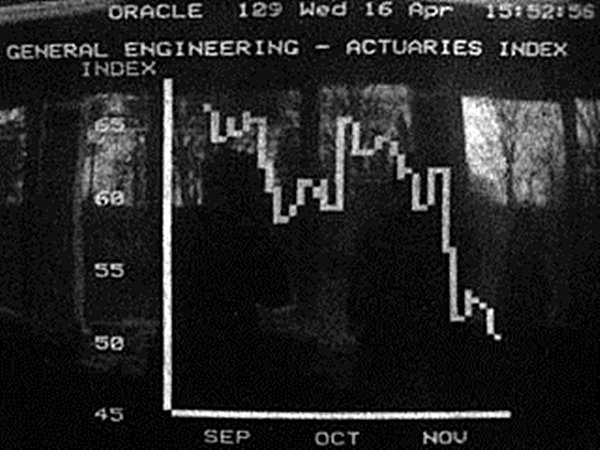 The familiar 2×3 block graphics were available at this time – indeed, p115 boasts a line graph of an Actuaries Index featuring them – but they were not yet used to enhance text pages. 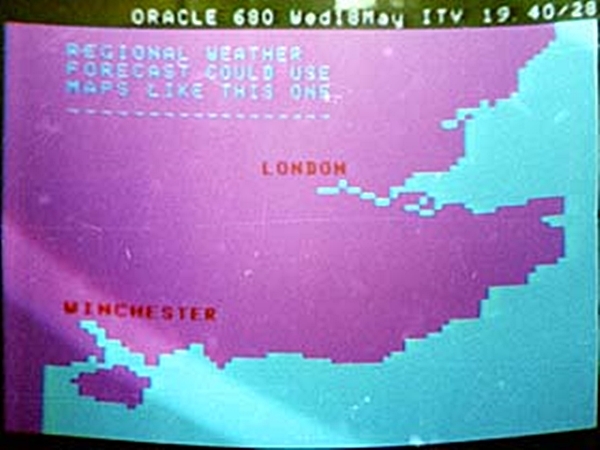 The teletext receiver was displayed at an event at the IBA HQ, Crawley Court, in Winchester, though unfortunately it was set up facing a large panoramic window. Note that, as with many of my own pictures below, the page number in the header row does not freeze when the required page has been captured, so that the number in the picture does not correspond to the page displayed. 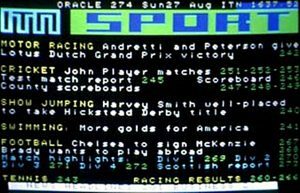 CEEFAX and ORACLE were very keen on viewer participation, as this shot from September 1976 shows. That’s me – third from the bottom! 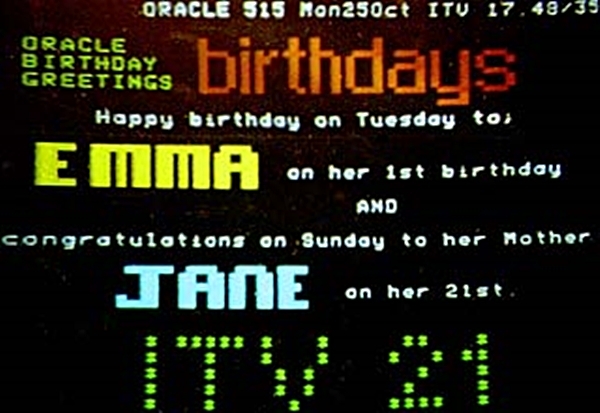 Another way to attract feedback was to advertise birthdays, as in this promotion linked to the ITV 21 celebrations. I sent in a postcard for some relatives, and the result was these two screens. 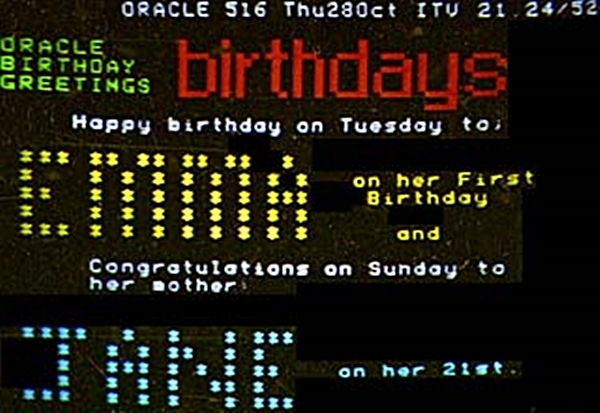 The first uses the teletext 2×3 block graphics, and the second uses text only. 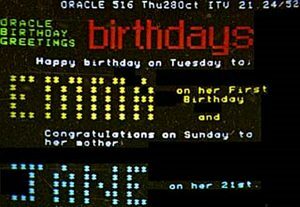 That’s because Oracle were kind enough to send out thermal printouts, which could contain only text, to the lucky birthday girls and boys. The Wireless World decoder was originally fitted with a generic ASCII character generator ROM. 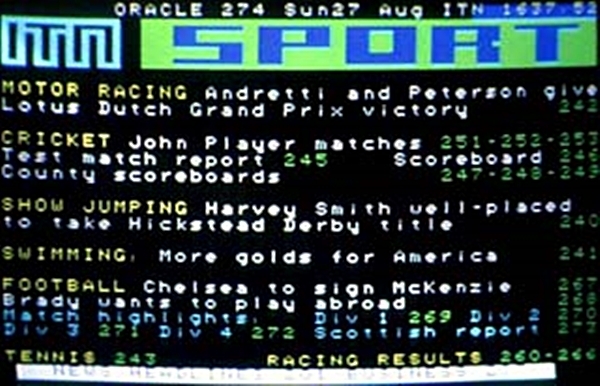 The 1976 specification led to manufacturers producing teletext-specific ROMS. 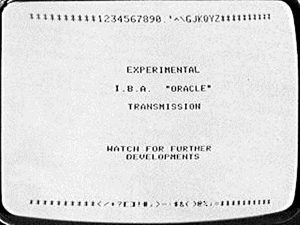 A modification was published allowing a Texas Instruments TIFAX ROM to be fitted in the WW decoder, and this convenient ORACLE test page shows the “before” and “after” results. It seems to have taken me a fortnight prior to Christmas 1976 to install. 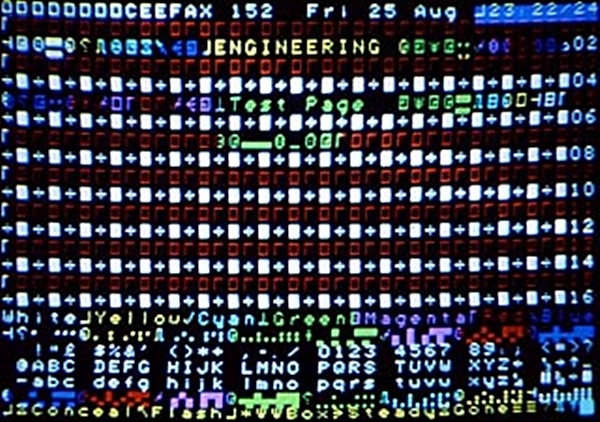 The handful of glyphs which were introduced with the Tifax ROM together with a few others, such as the “£”, “$” and “@” signs were specific to the UK Character Set. Later specifications allowed for a further seven international variants so that accented characters and currency symbols could be accomodated. The set to be used is determined by three control bits in the header row (Packet 0) and can be different for each [sub]page. 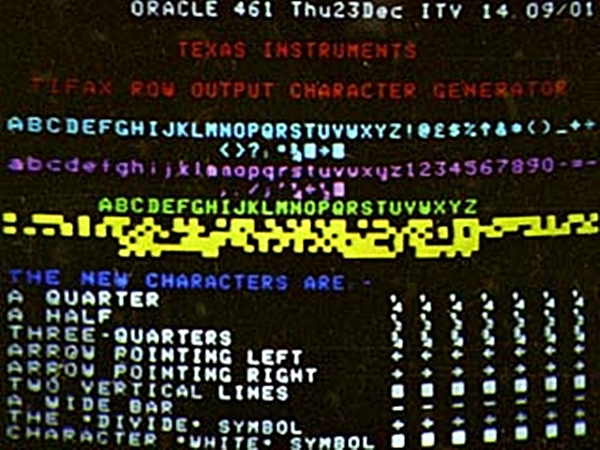 Later specifications still of what was now known as “Level One Teletext” allowed for individual glyphs to be defined by information transmitted in row numbers higher than 24 and the default transmitted character in any given position on the screen could be overwritten by a suitably equipped decoder to give the correct glyph. It could look rather odd in practice – a page of text appears as normal, and then a moment later some of the characters change shape! 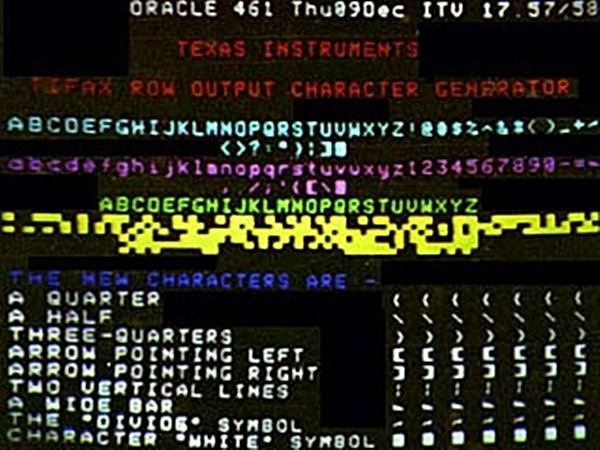 This animated graphic is a composite of the above two test pages showing a close-up of the characters displayed by the generic ASCII ROM and the new Tifax ROM. The ‘Two Vertical Lines’ character fourth from the bottom has merged into a single white block, because of the character-widening circuitry intended to overcome the low video bandwidth. The lines should be side-by-side like this: ||. 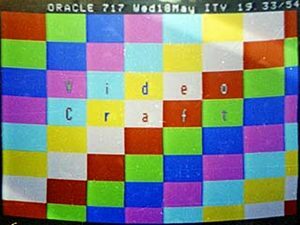 The 1976 specification introduced four new display modes – Double Height, Background Colour, “Discrete” Graphics and “Held” Graphics, whereby the most recently transmitted graphics character could be displayed instead of the blank character normally used in place of a “control” character. Flushed with success at constructing the WW decoder, I designed a new board to display these new modes. It seems to have taken me about a month, just after Easter 1977 to install. Note that the colour change is specified to take place at the right-hand edge of a character, though the WW decoder (because all colour changes originally took place invisibly during a black space) had the change occur mid-way through a character. You can see that the changes from blue to yellow, prior to the word “HOLD” near the middle of the page, are half a character early. I corrected this later. Double Height, Background Colour and Concealed Text in action. This creditable rendering of the LWT logo looked a mess without the new facilities, but unfortunately I didn’t take a “before” picture. Note that in the 1976 specification there was no provision for black text on a coloured background, though this was brought in later in the “Full Level One Facilities” (FLOF) specification that also included the concept of four coloured Fastext links at the bottom of the page. 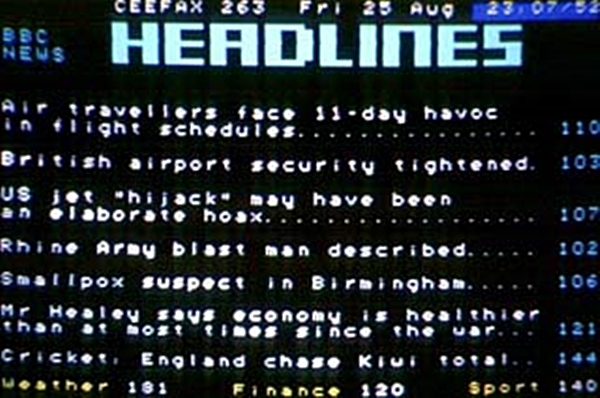 Ceefax very rarely used black text, though other services, notably Channel Four’s 4-Tel magazine produced by Intelfax, more frequently did so. 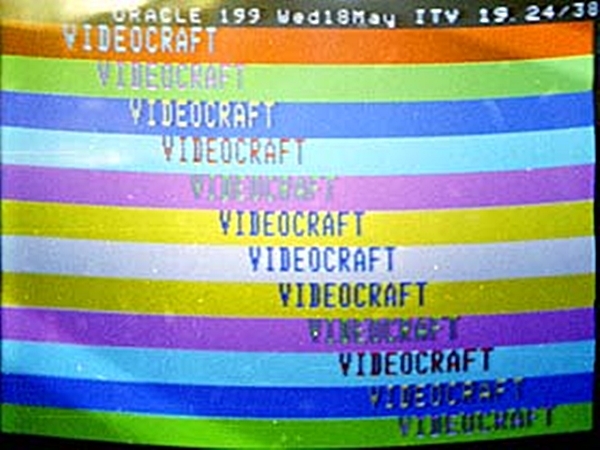 Videocraft made one of the few add-on commercial teletext decoders, and these are two of the pages that ORACLE provided such firms for display in shops and trade shows. 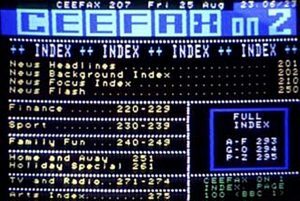 CEEFAX were very wary about introducing New Technology (a dispute with ACTT had put ORACLE off the air for many months) and so it wasn’t until 1978, when agreement had been reached to use an appropriate VDU (as they called monitors in those days) that they started to try them out on air. These shots show a couple of the designs transmitted as a test. I turned off the background colour for the first picture, to show how it would have been displayed on an old-style decoder. You will note that I have added a blue background to the clock at top right, which is permanently cut into the tv picture. Other peculiar “bespoke” effects were to follow. 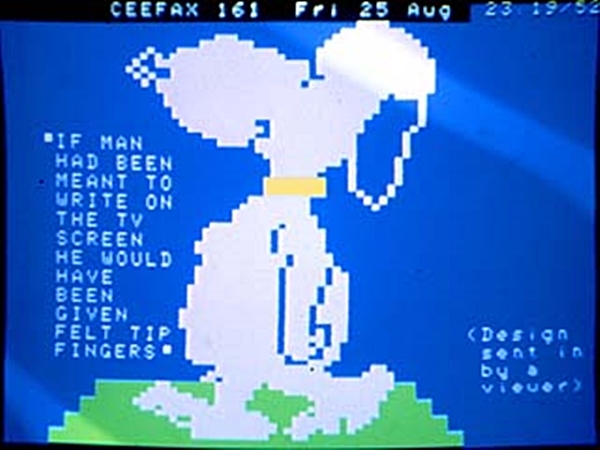 In the early years of teletext, CEEFAX in particular had an informal, “chummy” atmosphere, and silliness such as this example from 1978 was not uncommon. Over the spring and summer of 1978 I constructed a Forgestone colour receiver. 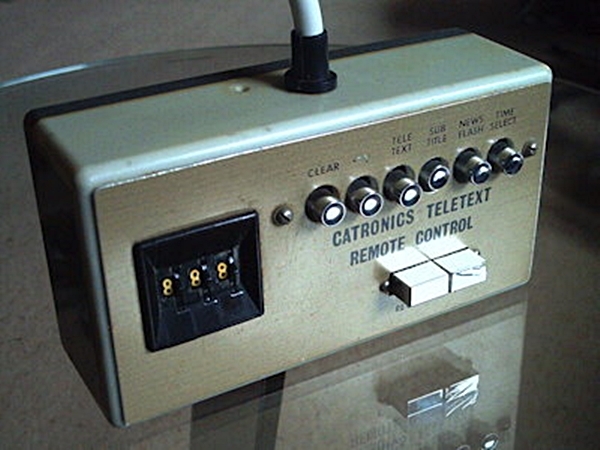 This was a state-of-the art design in kit form, and the huge plywood cabinet I built for it allowed me to mount the Wireless World teletext decoder internally. It had a 22″ screen which I underscanned to produce the full rectangular picture, and the teletext display was adjusted to be the full width of the screen. 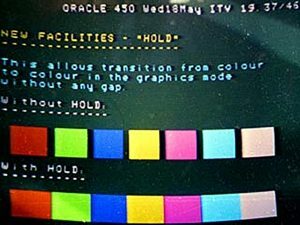 I ran off a roll of colour slide film as a record of the initial picture quality, and this included several teletext shots. This was the run-up to the famous “Winter of Discontent”, and the news stories reflect the climate of the time. 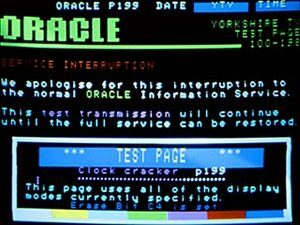 ITV was just emerging from a long technicians’ strike, and programmes and ORACLE were returning to the screen, though more strife was to come. CEEFAX on 1 was always formal and newsy, while on 2 it tended to let its hair down. Following a similar page structure to 1, 2 had more background news and features. 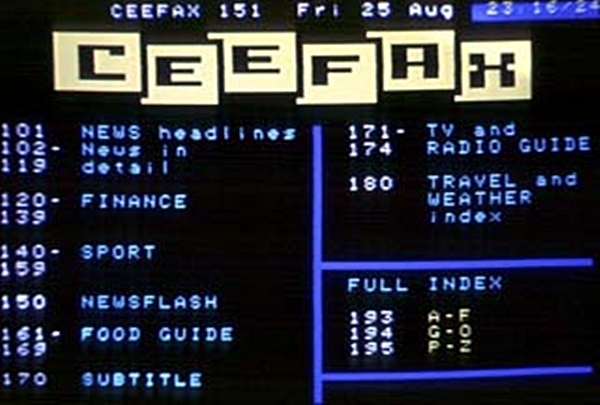 At one time it changed its name to “Orbit”, though the header rows always showed “CEEFAX”. This index page and weather map from CEEFAX on 1 show that the design hadn’t changed from the early days. 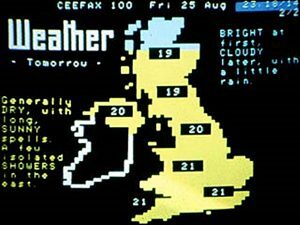 Here in this incarnation of CEEFAX on 2 however, there’s a distinctly busier look to the design, with the new facilities in evidence. The very first CEEFAX magazine was transmitted on one channel only, then it was duplicated on the other, with BBC2 using an updated set of “control codes”. Originally both had page numbers in the 100s on one day and 200s the next. Eventually, a different service was transmitted on each channel, with BBC1 using Magazine 1 and BBC2 magazine 2, and the old control codes were abandoned. 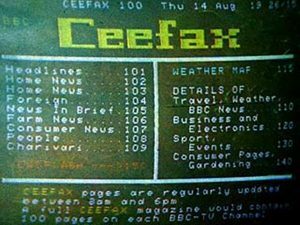 The two services continued like that for many years, until in the late eighties CEEFAX was relaunched with several magazines on each channel. 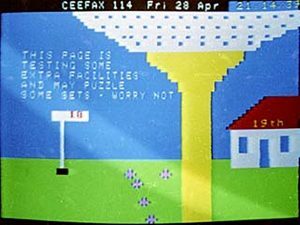 Many pages were common to both, many were different, and some were unavailable, or switched channels, at various times of day and on different days of the week. The Great British Public were not ready for such a complex service and soon it changed to a simpler format, with most pages duplicated on both channels and available all day and all week. 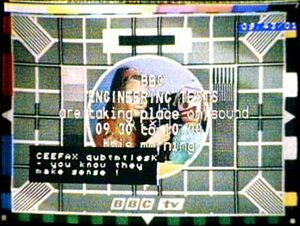 This engineering test page started life as a combined clockcracker, ASCII character, graphics shape and control code test, and the new facilities were “bolted on” in this later version. Codes in the ASCII range 0-31 are not intended for display – they indicate to the decoder the atrributes required for subsequent characters on the line – Yellow Text, Double Height, and so on. Each change requires its own character and takes up a space in the text. In fact in the original specification each occurrence of a control character was to be replaced by a black space, but with the new facilities coloured spaces or graphic characters may be displayed to improve the appearance of the page. 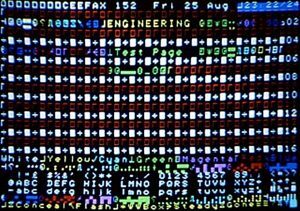 The Tifax character generator ROM contained glyphs for the characters in the range 0-31 and it was an easy matter to have the decoder display them, thus identifying the control characters and showing how some of the pages were composed. 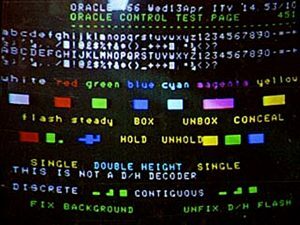 The second shot shows the same test page with control characters displayed, and the animated detail shows the glyphs for some of the control characters more clearly. The clockcracker test is a special arrangement of two characters that ensures that the longest possible sequences of 1s or 0s are transmitted consecutively in order to test or “crack” the frequency of the clock oscillator. The only way to ensure that the clock generator – the heartbeat of the decoder – is in step with the transmitter is by comparing it with the pulse that occurs during a 1-to-0 or 0-to-1 transition – when consecutive ones or zeroes are transmitted there’s no pulse. If transitions are too far apart it’s possible for the decoder to miss a beat, and subsequent characters along the line will be corrupted. In this BBC test page two rows of clockcracker characters are sent alternately. On even rows the ÷ sign and white block give a sequence of …/01111111/11111110/… while on odd rows the Red Text/NUL sequence gives …/10000000/00000001/… The trick was to adjust the frequency of the clock oscillator carefully whilst observing the clockcracker display for minimum errors. As an aside, here is a later version of the Engineering Test Page simulated in a graphics package. 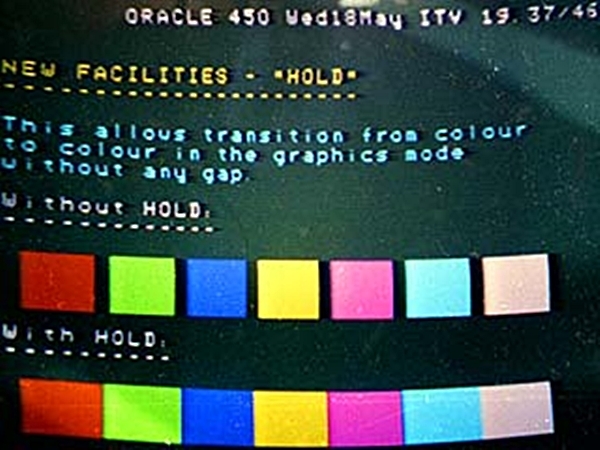 Held-graphics colour bars appear on Row 7 and a held-graphics sequence including ‘conceal’ character codes is included on Row 5. The animation simulates pressing the ‘Reveal/Conceal’ key every five seconds or so. 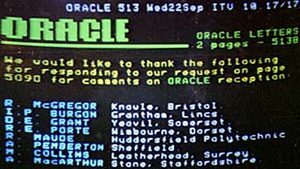 When ORACLE (and CEEFAX for that matter) began broadcasting, the magazines were inserted into the video signals emanating from London, and could only be received in the regions if they passed through all the intervening equipment undisturbed. 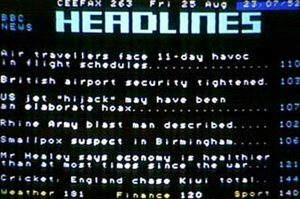 If a local programme (or adverts, or continuity announcement) were on-air, there was no teletext. 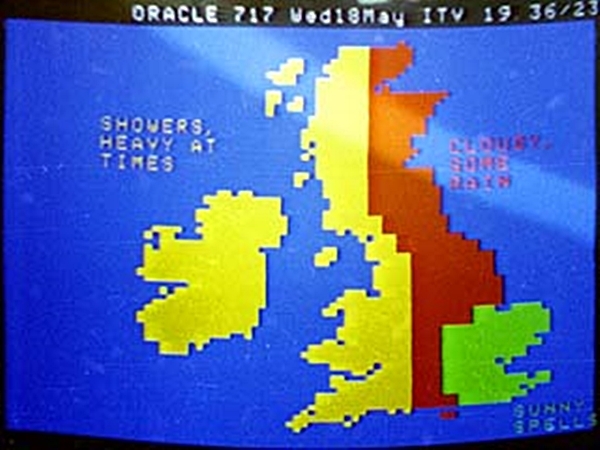 Eventually “Data Bridges” were installed at all ITV and later BBC studio centres so that the teletext signal could be stripped off the sustaining video feed from London and inserted into the signal going to the local transmitter. In addition, the London signal was cleaned up, which improved reception, and local pages could also be inserted. If the signal from London failed, the ITV regional Data Bridges inserted a simple test magazine 1, comprising 99 pages of the caption shown here, and a clockcracker on p199. 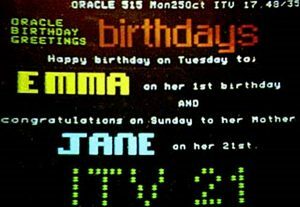 Although the ITV company was identified, the date and time were not generated dynamically. 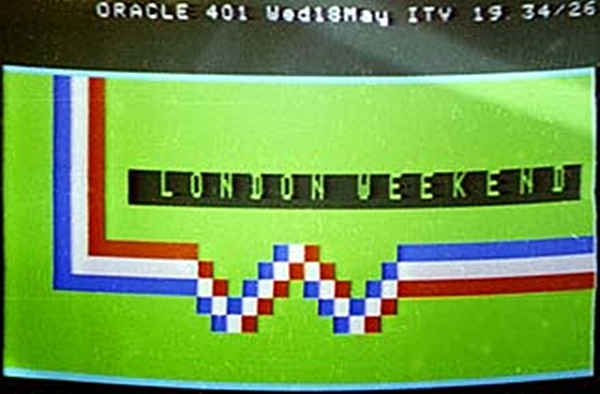 There was also a generic ORACLE caption occasionally transmitted from London, and it was that that was seen during the prolonged ITV-wide strike of 1978-79 when both programmes and text were off the air. 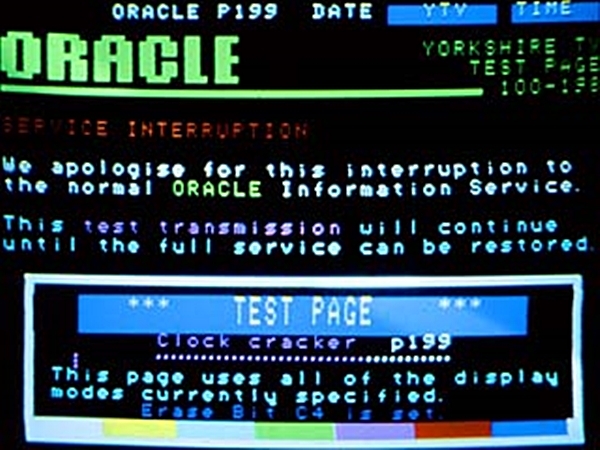 Prior to the 1977-78 industrial action at Oracle, the pages were only updated during weekdays and the news service did not appear in the evenings. However, the full service was now beginning to appear. 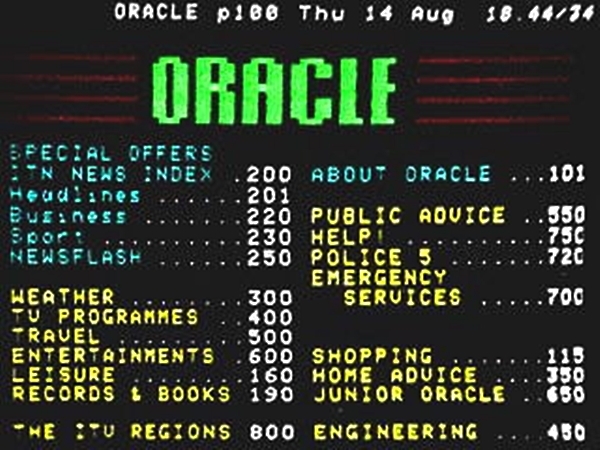 ITN provided the news service for ORACLE, and had its own magazine on the 200s. 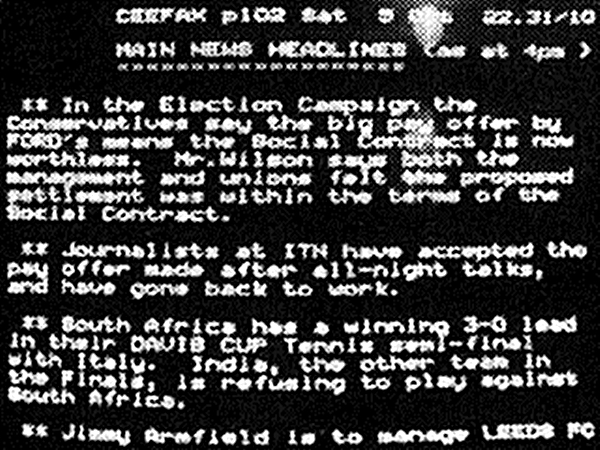 Note the headlines in upper case – ITN newsflashes were also all in upper case white text, which made them look more like agency tickertape. 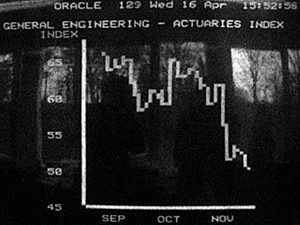 ORACLE has always used most of the eight possible magazines, originally transmitting them sequentially, in numerical order, at the rate of four pages per second. 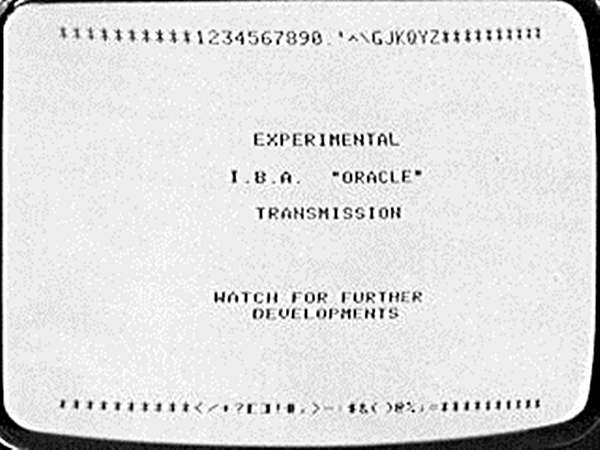 When the number of data lines permitted was doubled to four per field, the IBA launched “High-Speed ORACLE” and transmitted four magazines, one on each data line, which unfortunately is perceived by the viewer as only two pages per second (the rolling numers of the other six, in different magazines, are not seen). 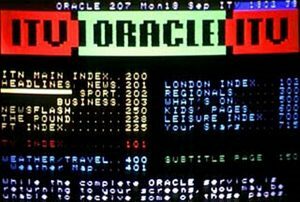 ORACLE quickly had a rethink. Later, when more than twelve or more lines became available, the situation was more complex, and it was possible to put two or more magazines sequentially in each stream (group of lines) which made access seem faster by increasing the speed of the rolling numbers in the Page Headers, while having parallel streams meant the viewer did not see all the magazines rolling by while waiting for the selected page. The ITN pages were now available on a Sunday – and a Bank Holiday weekend to boot! 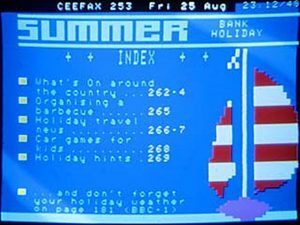 Meanwhile CEEFAX on 2 devoted a whole section to the aestival festival. 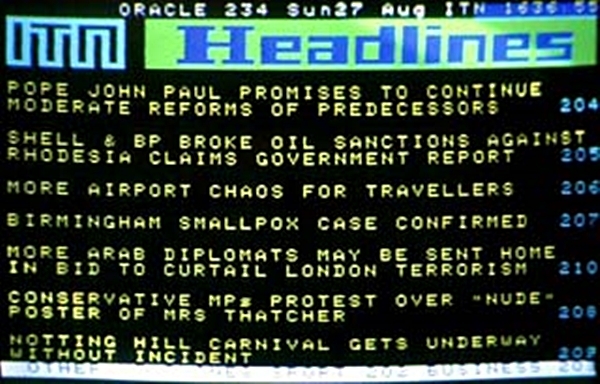 Newsflashes were one of the novelties of teletext from day one. It was possible to have them interrupt your viewing with all sorts of things you didn’t want to know. 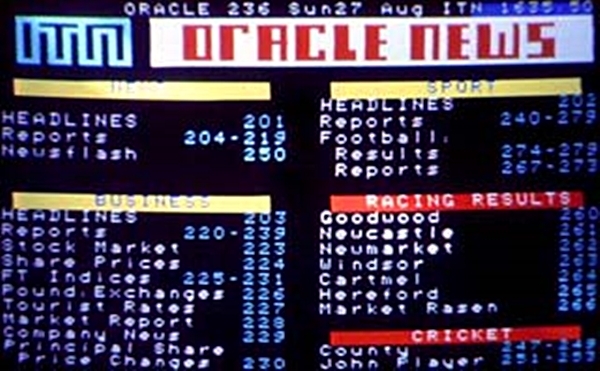 CEEFAX newsflashes were quite frequent – ORACLE ones less so, particularly in the early days when the service wasn’t updated after 1800 and at weekends. Because the Wireless World decoder was a set-top box with buttons and switches (the remote control came later) it was annoying to have to get up to clear each newsflash manually, so I put in a timer that erased each one after about fifteen seconds. I can’t understand why that’s never been a standard feature of decoders. I wonder how many viewers habitually selected the newsflash page in those days (or even knew it was there)? I tended to watch the subtitles instead, but I well remember the Iranian Embassy siege story starting to unfold by newsflash while watching the Embassy Crucible Snooker Championships, so I was probably less annoyed or surprised than most when live coverage switched from one Embassy to another. 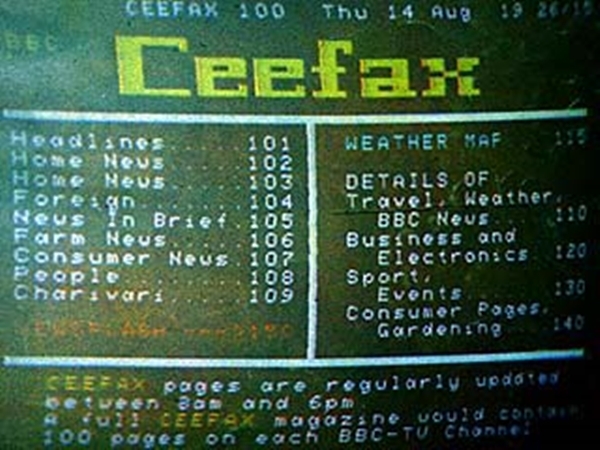 For a time, CEEFAX provided a “Latest Page” feature on p190, whereby the last page to be inserted anywhere in the magazine was also placed on p190. This was ideal for shop displays, or keeping up with different sports results, for example. By 1978 it had been reduced simply to a menu of some of the latest pages, before disappearing completely. 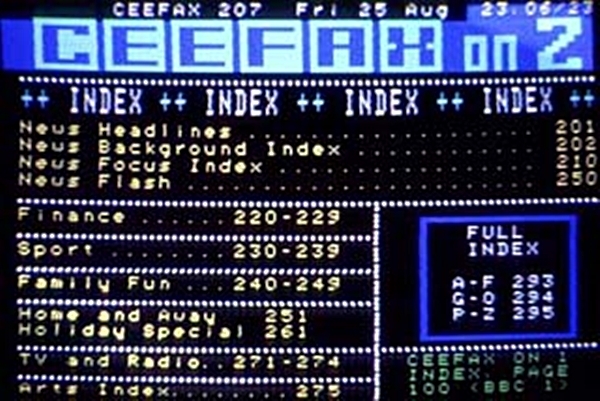 Teletext page numbers come in three parts – the Magazine number; a two-digit Page number; and a four-digit Time-code number. The idea was that some pages would only be transmitted at certain times, and you could key in that time code to receive that version of the page. 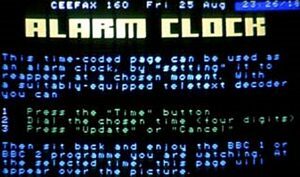 One practical use of this feature is the “Alarm Clock” whereby the page could be required to appear at the top of any given minute. Later, it was realised that a more appropriate use would be to identify each sub-page of a rotating page by adding the appropriate time code – eg 1980012 for sub-page 12/15 of page 198, so you could select just one page of a set. There was also another ingenious application. 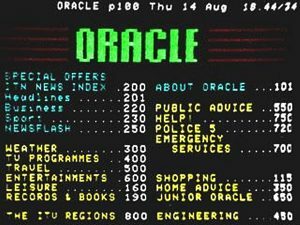 A commercial enterprise advertising on ORACLE invited you to phone a premium rate number and be allocated your own “sub-page”. Having done so, you would then select page 777xxxx and see a menu of features. You would then key the appropriate number on your phone, and your requested page would be transmitted immediately. If you just keyed in 777 with no sub-page, you could see everyone’s selected pages fleetingly, but they were immediately erased. Sadly, the alarm clock feature fell out of use, though there’s no reason why – it would not interfere with the use of the codes to identify sub-pages. 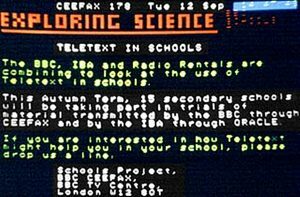 There were grandiose plans proposed for CEEFAX, ORACLE and education, and the new medium was seen as a replacement for the expensive schedules and booklets supplied to schools each term. 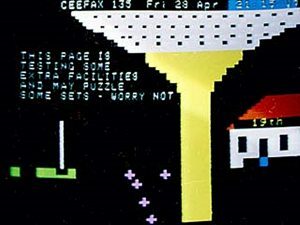 There were a few pages containing listings and text and simple graphics relating to a few series, and later on, Telesoftware was used to a similar end. 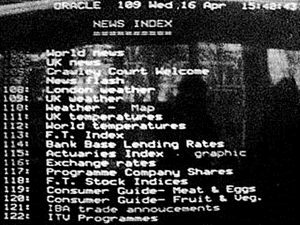 However, nothing much survived of the early ideas, though it’s worth noting that RAI, the Italian public service broadcaster, still broadcasts telesoftware on its teletext pages. 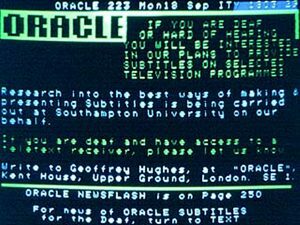 ORACLE and Southampton University did a good deal of research into teletext subtitles, and when they eventually started their composition was slightly different from those on CEEFAX. 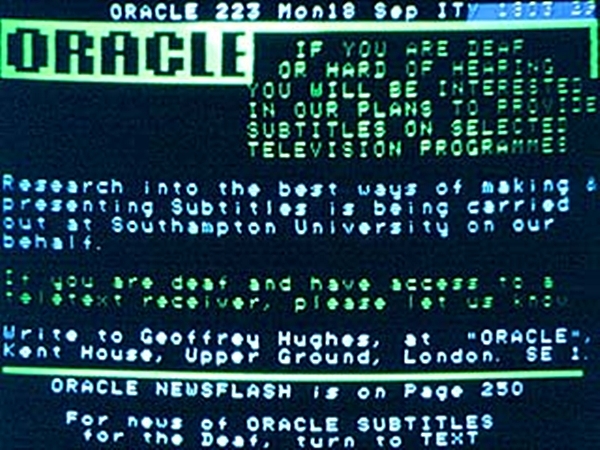 ORACLE subtitles began life on p199, which could be obtained by pressing “999” on most handsets. I often wonder if this was the origin of the idea of using p888 on all services which was introduced on 1 April 1981. From that date, only subtitles were included in Magazine 0 (the 800s), which was also given its own exclusive data line in the blanking interval. 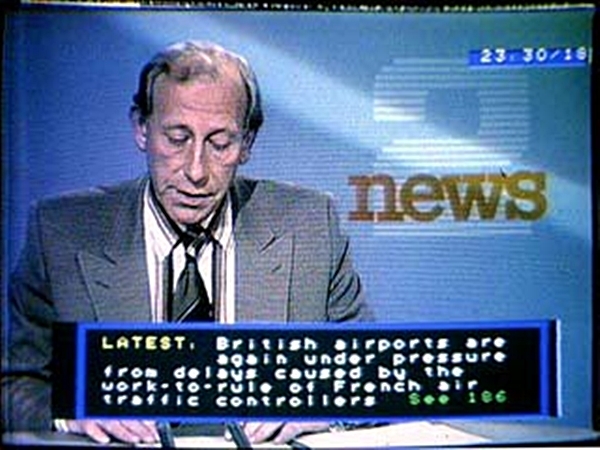 This move allowed subtitles to be inserted into the video signal by equipment not connected with the main teletext system, and this was done in Ceefax from 1985, which allowed subtitles to appear on both BBC1 and BBC2 programmes at the same time. Previously a programme on one channel would occasionally start without subtitles if a subtitled show on the other channel was overrunning, though it was possible to insert an ‘apology’ subtitle to that effect. 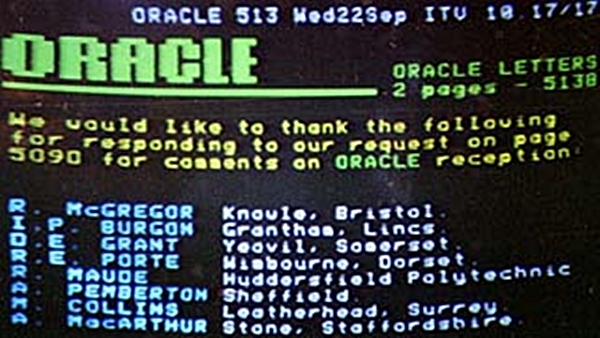 This ORACLE information page was on p150 – the same as the CEEFAX newsflash page – hence the redirection to ORACLE’s p250 Newsflash page, which was aimed at owners of the ‘manual’ decoders of the day, where page numbers were selected on thumbwheels and full page/boxed text displays were toggled with a switch. 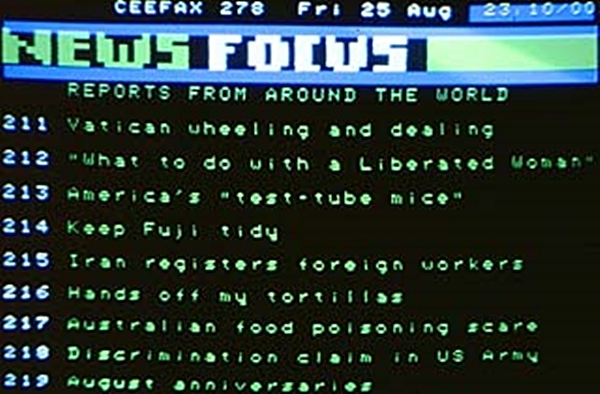 The bottom four rows of this page were boxed and would have appeared as a newsflash/subtitle cut into the picture on the WW decoder, though a later decoder would either display the whole page or just the boxed text (depending on the information set in the page header) – turning to “TEXT” as directed wouldn’t switch between the two as suggested here. 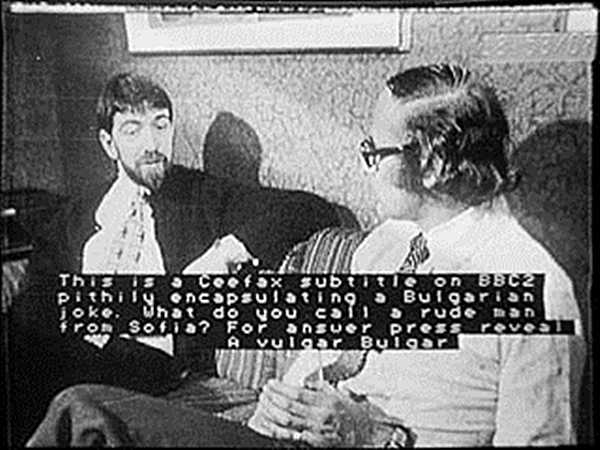 Proper subtitles linked to programmes were rarely transmitted before 1980, and until then Page 170/270 contained static text which changed on a daily basis, cut into the tv picture, purporting to be “CEEFAX Subtitles”. They were never double height, as real subtitles invariably are, and they often exhibited the strange sense of humour peculiar to CEEFAX. 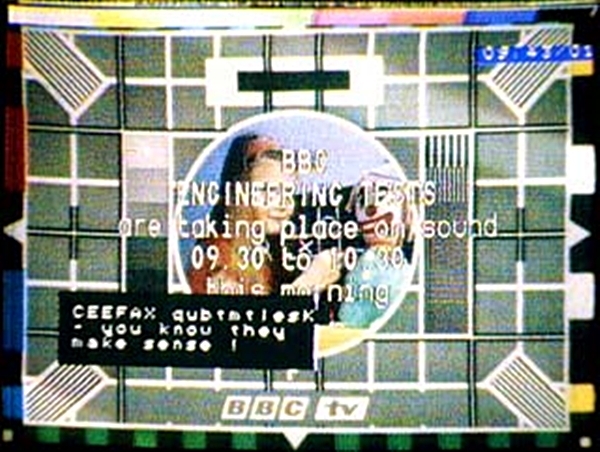 The test card was received from an out-of-area transmitter, hence the snowy picture. 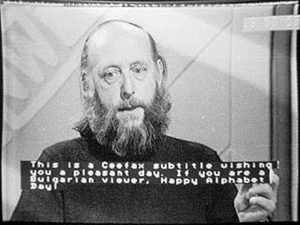 Such poor reception often results in incorrect teletext characters, though I think on this occasion the odd spelling of “subtitles” may be due to an ironic sense of humour on the part of the Editor of the Day. 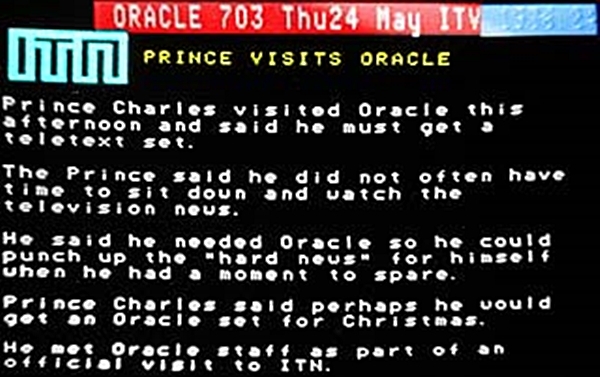 One Christmas CEEFAX transmitted an animated graphical subtitle which depicted the Three Wise Men travelling to Bethlehem. 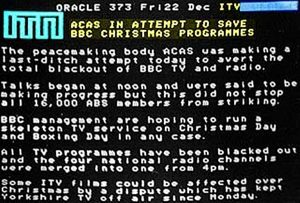 It was shown regularly throughout Christmas Day. 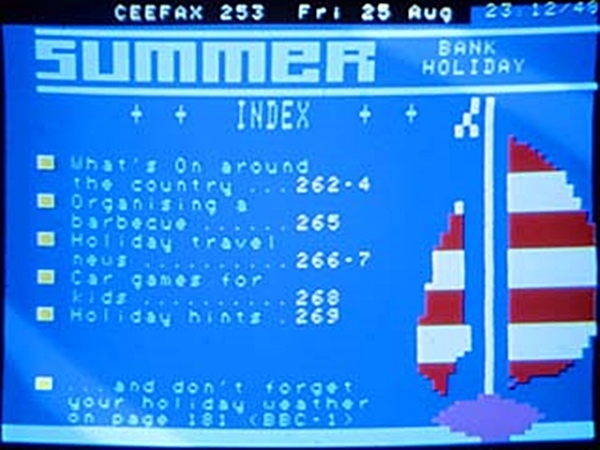 CEEFAX used to push the boat out at Christmas, with a fortnight of special features, stories, quizzes and puzzles. Nowadays – nothing special. I suppose it’s just a job ruled by bean counters like any other, now. 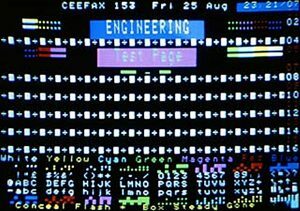 This stage production of this Latin and Old German language work was subtitled in English by CEEFAX. The subtitles were single height, pre-typed, and inserted manually (by several pairs of hands, in fact!) in the way such captions are these days sometimes inserted in to live scripted programmes. This four-part serial had “précis subtitles”. At the end of each scene a newsflash-style box appeared explaining to befuddled deaf viewers what had just happened. As far as I know the experiment was never repeated, though the idea has been resurrected as a feature of the new digital so-called ‘interactive’ service, whereby comments and critiques have been available as captions in Promenade concerts and Shakespeare plays, for example. Ironically, although the programme itself may be subtitled, the ‘interactive’ version never is. 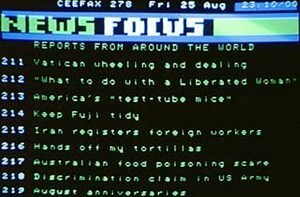 This short promotional film about CEEFAX that had been shown on several occasions had a special screening one lunchtime complete with closed CEEFAX subtitles. 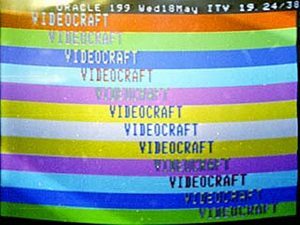 This was probably the first showing of a programme that had been subtitled in the way we now expect – that is double height, coloured, and synchronised to the videotape time code. 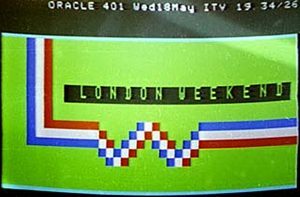 “The year 1979 will be remembered as the year in which, for the first time, a television programme was broadcast on the network with accompanying subtitles transmitted on CEEFAX. Blankety Blank was a game show involving very little dialogue, but plenty of on-screen text, and so was deemed an ideal choice for the first light entertainment series to be subtitled, in 1979. 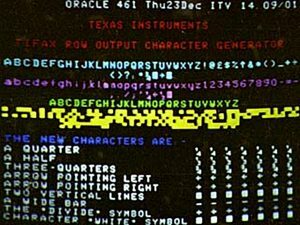 When ORACLE subtitles began, they had a slightly different style from CEEFAX’s in that subtitles were often built up row-by-row as the dialogue progressed instead of the whole screenful of three or four rows appearing straight away. 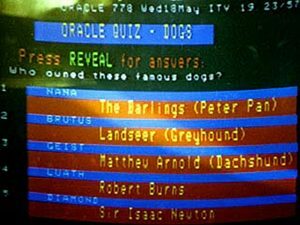 This proved the better format for quiz shows – for a long time CEEFAX used to present the answer at the same time as the question in fast-fire quizzes. 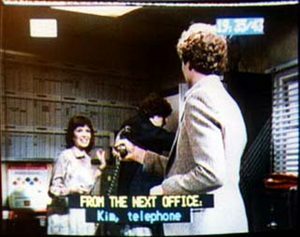 The final subtitle shot shows one of the earliest regular subtitled programmes, from about 1980. It was a Sunday evening BBC1 series about a small charter airline business (not to be confused with the later one starring Roy Marsden made by Yorkshire Television). The subtitle actually belongs to the previous scene – I “held” it while I was taking the photograph. The white rectangle at top left is where the page number selected by the recently added remote control appears. It was completely unlike the present day page selection – in fact almost entirely opposite. On pressing “page” on the handset, page acquisition was inhibited (and so served as a hold-page function) and the white rectangle appeared, boxed, showing the selected page number, in black, as the next three keys were pressed. When the page was acquired, the number appeared white-on-black as normal, and the box disappeared from the tv picture. 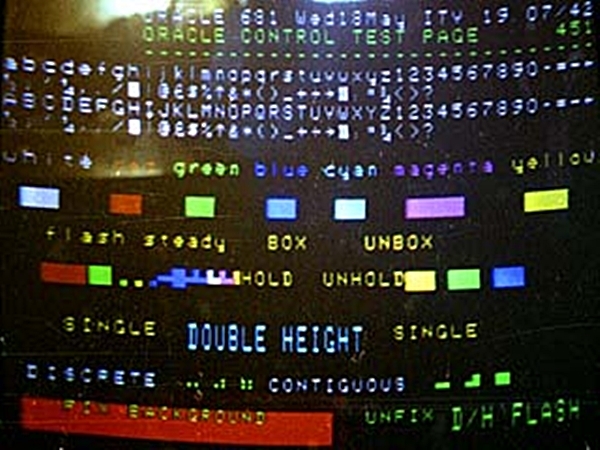 All the teletext functions operated in the tv, as well as the text, mode, so it was possible to select pages in the background, and switch to them once they had been captured. At this stage, I had modified the character generator to give a one-pixel gap between letters instead of three. Comparison with the earlier shots shows how much more legible this was. Satire was the order of the day as the Winter of Discontent bit harder. It was set to be a dreary Christmas on the broadcasting front up here in the frozen north as this ORACLE ITN news story explains. 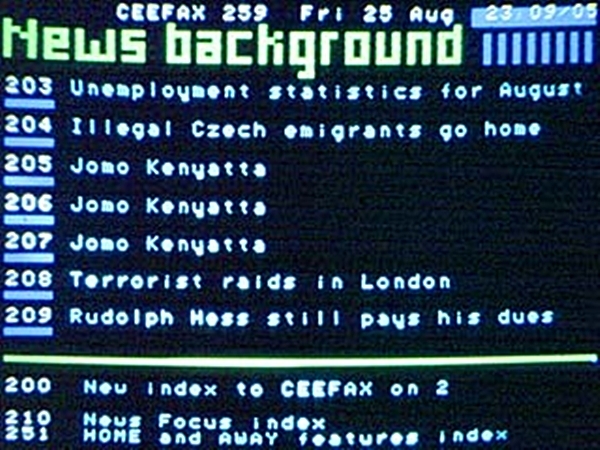 CEEFAX managed to put a slightly different spin on events as was their wont on festive occasions, and these two versions of their rotating news page demonstrate the unique ability of teletext to keep up-to-date as stories develop. 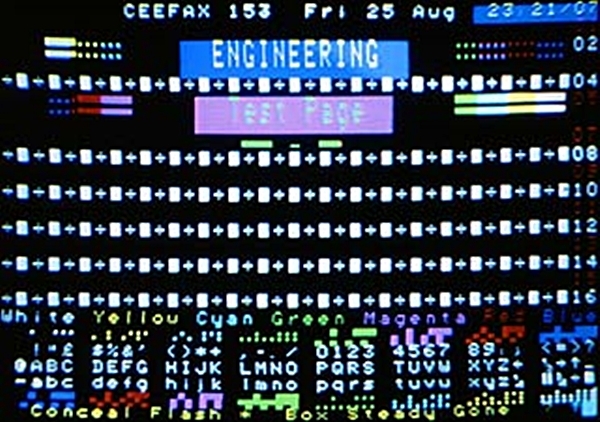 Esmeralda was the name CEEFAX gave to its original computer (though she had a predecessor – a thirty-page core-store that had to be programmed in binary). The one that replaced her early in the 1980s was dubbed Selene. 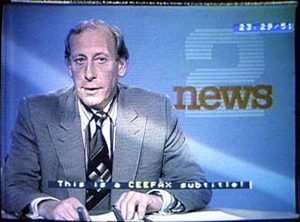 Thereafter presumably they were just called by the letters in the barcode on the cardboard box they came in, as CEEFAX was taken over by News and Current Affairs and the BBC was taken over by a pervading lack of imagination. Nowadays text services are served from the same faceless machine that generates the schedules, programme ideas and the virtual-reality reality show presenters. 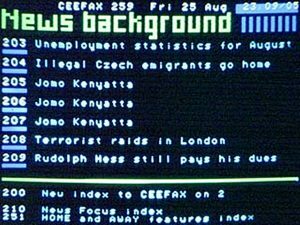 Back in 1978 though, despite the gloom and despondency prevalent at the end of Sunny Jim’s reign, CEEFAX managed a Christmas and New Year magazine packed with puzzles, quizzes, stories, humour, competitions and, yes, satire, before it was apparently outlawed during subsequent regimes. Meanwhile, I modified the Wireless World decoder to display a red background on the centre of the Header Row, as well as making the whole row double height. The page numbers did not “freeze” when the page had been captured, as was the case with more modern decoders. 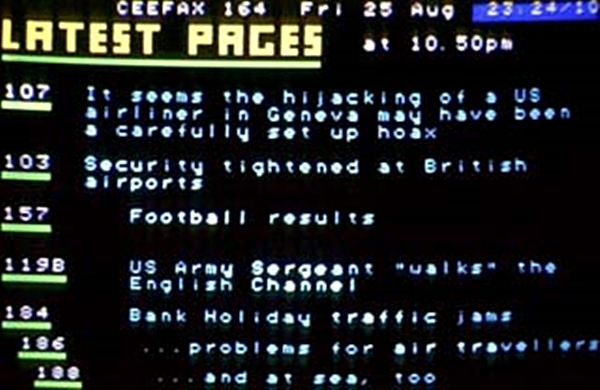 This news page would have been in the 200s, and the fact that 703’s header is displayed means that the magazines were still being transmitted serially, rather than in parallel with each magazine on a different tv line as was the case later (when you only saw the headers from the selected magazine). 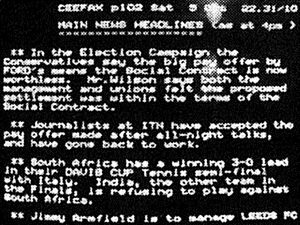 Finally, an oddity from 1991, captured on my BBC Microcomputer with a Morley teletext adaptor. The file was transferred to my Archimedes, and thence via a DOS disc to my Power Mac, where it was converted to a GIF file. Despite the rather circuitous route, I can assure you it hasn’t been edited along the way. 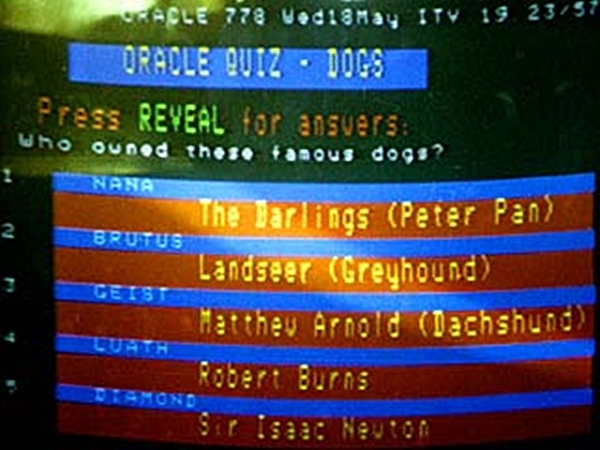 My faithful “Beeb” died in the early nineties, and with it went the teletext adaptor. 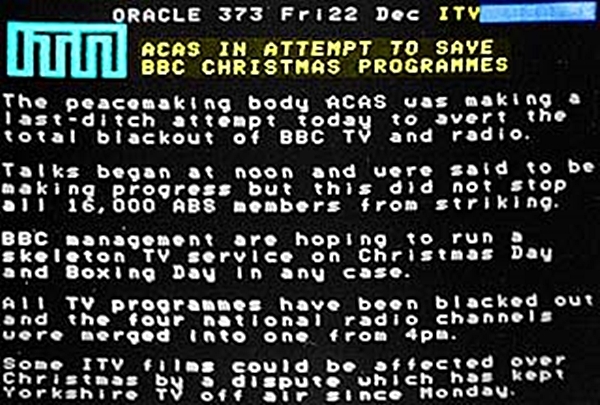 I don’t seem to have captured any other teletext pages, and this is the only one I transferred to the Archimedes.